Various dates in Dec, Westonbirt Arboretum, Tetbury, Glos. 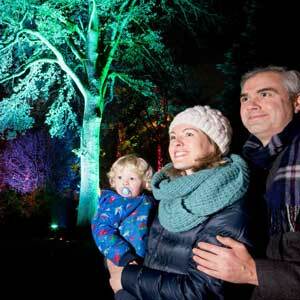 Set out on the enchanting illuminated trail and discover a magical world of breath-taking light spectacles and interactive displays amongst the trees! Once you’ve finished the trail, head to the new Christmas village, and soak up the seasonal cheer by listening to Christmas choirs, getting the whole family involved in arts and crafts, having a go on our fair ground rides, and catching a glimpse of some beloved Christmas characters.